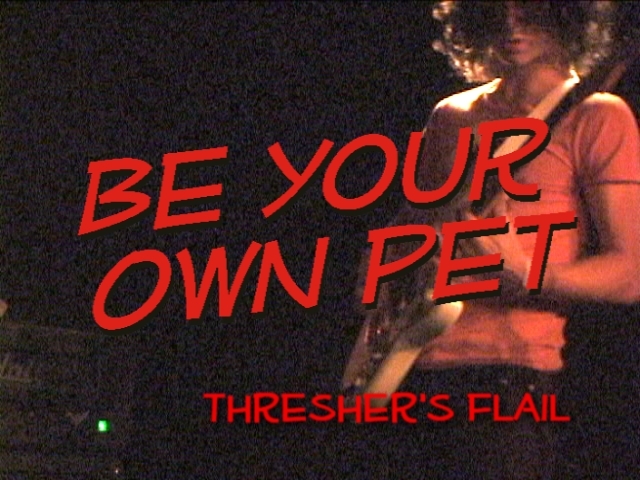 Be Your Own Pet, a teen band from Nashville TN, had a meteoric rise to fame back in 2004 when their debut DIY single became a radio hit in the UK. The band subsequently destroyed at CMJ and SXSW in the USA, Glasto and Reading in the UK. They had more record labels than haircuts, thru their own Infinity Cat to XL to Rough Trade, back to XL, and then Ecstatic Peace! in the USA. The album came out early in 2006. The founding drummer having quit to go to college, an even younger replacement was found and the band set out on an extensive road campaign. Here we see them on a friday night in Brooklyn, headlining over the Black Lips, typically tearing it up. The songs I've picked are that original hit, 'Damn Damn Leash' - an, um, relationship song - and 'Thresher's Flail' - the album's cryptic opener. Clicking the images will take you to the tunes on YouTube. The h.264's are iPod ready. Yes there is a DVD.